The SMD theorem says that the aggregate market demand curve only inherits a few properties from the individual demand curves: continuity, homogeneity of degree zero, Walras' law and a boundary condition that demand is large as prices go to zero. This basically says that the aggregate theory doesn't necessarily have much to do with the individual agents ... that the SMD theorem is the "anything goes theorem" (at least from the Wikipedia article). The theory at the macro scale only inherits conservation laws and symmetry principles from the theory at the micro scale. That is exactly the idea behind constructing an effective field theory! See the link for the definition of effective as it's used here. Let's say we start with the fundamental theory of quarks and gluons, QCD. It has an SU(3) symmetry (color) an (approximate) SU(2) symmetry (weak isospin/chiral) and an SO(3,1) symmetry (Lorentz), and obeys the basic conservation laws of physics (momentum, energy). 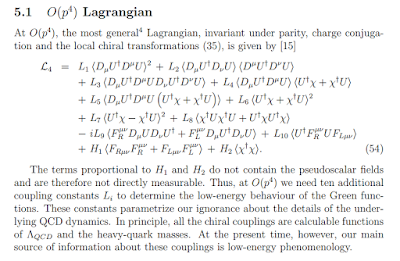 Now QCD is impossible (well almost impossible -- nice job!) to solve at the "macro" scale, so what do we think it looks like? Well, if we put the theory in a Lagrangian that takes care of the conservation laws . Do we have a theory of a representative quark? That doesn't make sense, really. Quarks need to come in pairs or triplets to cancel their color charge. In economics, agents actually need to sell stuff to each other so you can't really have just one agent . So what do we observe at the macro scale? Protons, neutrons, pions, ... hadrons. In macroeconomics, people have constructed aggregates like the price level and NGDP. Macro is primarily concerned with these aggregates. So hadrons on one hand and macro aggregates on the other are our "particle content". In physics, we then put these together into terms in the Lagrangian in ways that maintain the symmetries . It's mostly a process of index matching where you make sure there aren't any hanging spacetime indices (Lorentz symmetry) or isospin indices (chiral symmetry), etc. The key thing to understand is that an effective field theory (like chiral perturbation theory [3, 5] with empirical parameters Fπ and mπ) can look totally different from its microscopic (fundamental) theory (like QCD with only one parameter gs ). I think this is the heart of the SMD theorem. The effective theory of macroeconomics can (and probably does) look entirely different from the fundamental theory of microeconomics. The call for microfoundations was basically a call for a quark and gluon mechanism for any chiral perturbation theory result. That would be tedious. I can calculate a pion scattering cross sections more easily using Fπ and mπ with Fπ measured empirically than I can from setting up a lattice calculation to calculate Fπ from QCD. Additionally, there is no parameter Fπ for a single quark! The pion decay constant Fπ only makes sense for a pion. The bottom line is that representative agents (at the micro scale) and microfoundations assume the structure of the effective macroeconomic theory. They represent massive limitations of the possibilities -- and from what I've seen, may even exclude the real theory of macroeconomics. 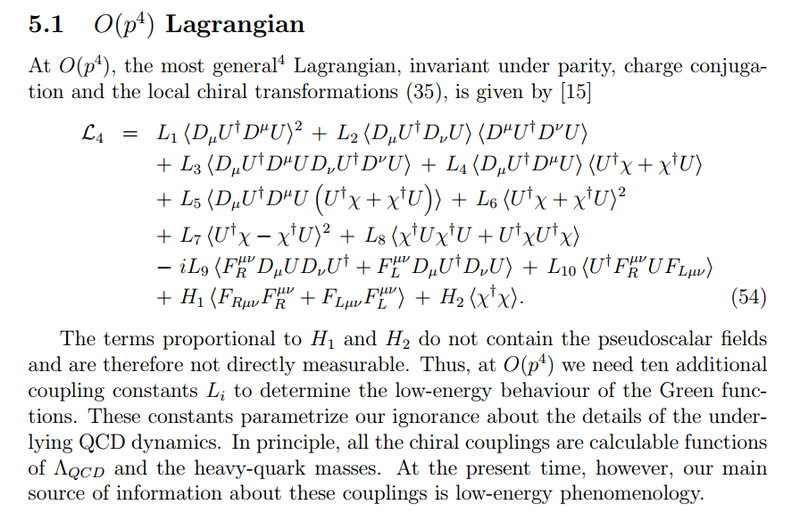 I'd like to think of information equilibrium relationships as the equivalent to Lagrangians that essentially guarantees Walras' law and homogeneity of degree zero. Is there macro money confinement? At the macro scale we never see money outside a transaction? Potentially interesting ... but total speculation. Chiral perturbation theory was such a good paradigm in the development of this whole idea in physics that sometimes people say effective field theory (the general term) to mean chiral perturbation theory (a specific effective field theory of QCD). Chiral QCD has massless quarks. I think Cesar Hidalgo in his Why Information Grows is saying macro constructs like GDP are not what we should be looking at - we need to be looking at the structure of the network. Also, it seems like equilibrium is problematic in economics - we are in an evolving network where the structure of the network is changing all the time. Doesn't Hidalgo talk about Prigogine and out-of-equilibrium is the key ? Regarding equilibrium, I'm not entirely sure what definition Hidalgo uses. And it's hard to identify out-of-equilibrium without knowing equilibrium. But the key point is that the information transfer model was designed to handle non-equilibrium and non-physical systems without well defined temperatures. far you can go with the maximum entropy or information theoretic arguments without having to specify constraints. This refers to partition function constraints optimized with the use of Lagrange multipliers. In thermodynamics language it’s a little more intuitive: basically the information transfer model allows you to look at thermodynamic systems without having defined a temperature (Lagrange multiplier) and without having the related constraint (that the system observables have some fixed value, i.e. equilibrium). Jason, a suggestion/request: it would be nice to have a permanent link to Fielitz and Borchardt's papers (the four revisions: the chance up the examples just enough to make them all of interest) in your right hand column. You'd think I might have their names memorized by now but their names are just alien enough sounding to my ear that I have a hard time with them. My usual procedure to find their paper(s) is to come to your blog, type "abstract" in your search box... scan down to the 3rd or 4th search result, open that, and then find your link in there. Maybe it's just me, but I must have done that at least 20 times or so now in total. Also, if I wait long enough before doing it again I'll forget exactly which search result to click on. Replace "the chance" with "they change" in the above. There is a link on the sidebar but it says "general information transfer model from physics". I should probably change the name. Nevermind!!!.... I just now noticed that it's already there. Duh.